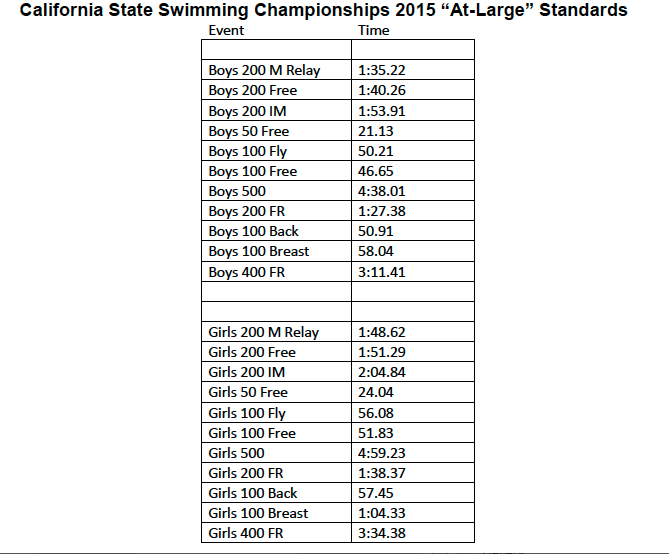 For the first time, CIF will host a state championship meet for swimming and diving. The meet will take place at the Clovis East high school pool on the weekend of May 22-23, 2015. For our section, the Southern Section, the top five swimmers from all four divisions combined at the CIF-SS meet will automatically qualify for the state meet. In other words, the results from all four divisions will be combined and the top five swimmers in each event will qualify. After that, at large entries will be taken although it is not yet known how where the cap will be set. The minimum time standards for at large qualification have been released and can be seen below. As you can see this will be a very difficult meet to qualify for. The at large times are all within just a second of the All-American consideration times!